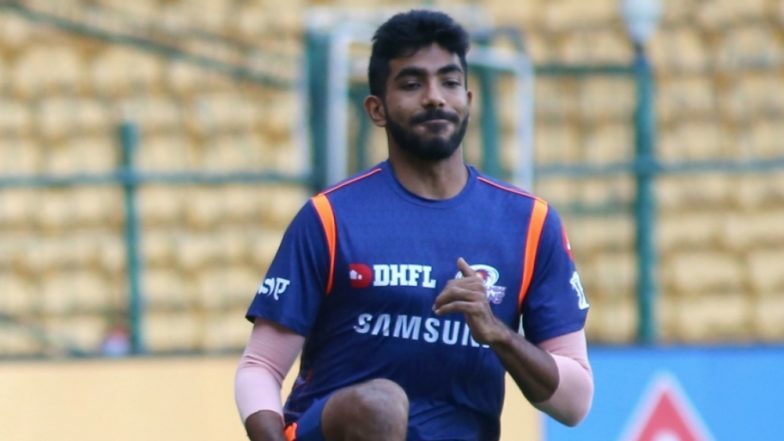 New Delhi, April 7: Looks like Jasprit Bumrah and injury scares are going hand in hand in this edition of the Indian Premier League. After hurting himself in the first match of the season against Delhi Capitals at the Wankhede Stadium, he was seen with a black spot around his right eye during Saturday's game between Sunrisers Hyderabad and Mumbai Indians at the Rajiv Gandhi International Stadium in Uppal. Speaking to IANS, sources in the know of developments said that the black spot was a result of a ball hitting Bumrah during practice. "He was hit by a ball during training. Luckily, the balls used for fielding are slightly softer and it was just a bruise and there was no serious impact on the eye," the source said. All eyes have been on the Mumbai Indians pacer as he is not just an integral part of the IPL franchise but also India skipper Virat Kohli's main weapon in the national set-up. With the World Cup round the corner, every effort has been made to ensure that he doesn't suffer any injury going into the showpiece event in England. Jasprit Bumrah Slammed by Netizens for Ignoring the Gateman’s Handshake Ahead of IPL 2019. Even after his painful fall in the first game of the season, India physio Patrick Farhat immediately contacted MI physio Nitin Patel to check on the status of Bumrah's injury even though it was just a shoulder spasm and the pacer was already feeling better by the end of the game. While Bumrah not coming out to bat in the Mumbai innings in that game raised further concerns, it was later said that it was just a case of the team management taking a precautionary measure as he is an integral part of the Indian team with the World Cup round the corner. "He was fit and it was just a case of shoulder spasm, nothing serious at all. He is an integral part of both Team India and Mumbai Indians and with the World Cup round the corner, the management felt it was best to keep him away from the batting crease," the source said. "Everyone was concerned and Patrick spoke to Nitin next morning to gauge the situation and the future course of action as Bumrah is an integral part of the Indian team going into the World Cup in May."